I wanted to show the message I received from my friend and travel companion upon return from our holiday. It underscores the result of a uniquely positive experience. It’s evident that his text message highlights the sentiment of a man who experienced something different, saw something authentic, and gained a perspective that was humbling. To acquire these things, I believe you need to get off the beaten path and under the skin of the place you are visiting. In my lifetime, I have taken many vacations where the excitement that precedes the trip far outweighs the actual time spent enjoying it due to improper planning, exhaustive and taxing travel schedules, or choosing a destination that doesn’t lend itself to true relaxation and peace. We are so often in need of a break from the sensory attack of modern life—the exhaustion of work and family obligations, the onslaught of Facebook notifications, uphill in-box battles, frightening road-rage incidents, and cantankerous colleagues, yet we usually learn the hard way that we’ve squandered our precious vacation time unmercifully. This is the story of two old friends traveling together for a couple of weeks through Thailand and Cambodia and the positive effects it had on the soul resulting directly from the freedom of having little agenda while getting as far from civilization as roads would allow. Knowing what we wanted to achieve before setting out enabled us the ability to cultivate an experience rich and rewarding. The key to making this connection for us was the understanding that relaxation doesn’t always equate simply to rest. Adventure into the unknown can often spell stress and exhaustion. The question then becomes, how do you venture into the unknown without struggling to keep order and remain comfortable. The answer, for us, is simpler than you’d imagine—let it go. Let go of the need to plan everything, to know everything, and to understand everything. Allow ourselves the freedom to make it up as we go, to trust our instincts, and let life unfold naturally, for once, in our highly structured lives. • Travel to the North and ride motorcycles through the mountains for about a week. • Make our way back to Chiang Mai in time for the Thai New Year’s Celebration. • Venture onward to Cambodia to engage in their New Year’s festivities. • Make our way to the legendary Angkor Wat Temples outside the city of Siem Reap. • Take in a few days on the remote Thai island of Koh Chang. • Quick souvenir hunt in Bangkok. 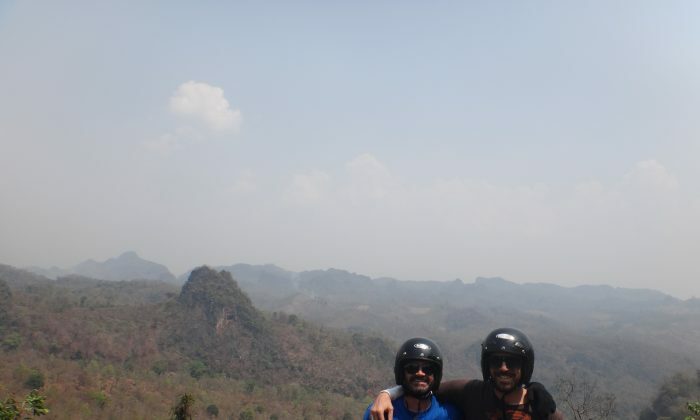 The highlight of our adventure was without doubt the five-day motorcycle ride through the Northern Thai mountains on the almost too perfect Mae Hong Son Loop—a circular 400-mile route beginning and ending in Chiang Mai that dances along the Thai-Burma border and passes through roughly five major cities spanning two provinces. We rode for almost a week with only a framework of an itinerary and no encumbrance of obligation. Setting out from Chiang Mai in the heart of the North, we penetrated the mountainous countryside as we screamed East toward Mae Siriang and felt the stresses of every day life peel back like layers on an onion in rapid succession as the wind whipped at our faces and the sun tried to sting any bare skin it could find. It is about as beautiful and serene a ride as one could imagine. This bucket-list experience is known among motorcycle enthusiasts as a rite of passage. Two days into the ride we coined the phrase “Mountain Motorcycle Meditation,” which we defined as our ability to drift endlessly through deep self, exploring our thoughts and feelings from the unique perspective of carving through the countryside at 70 miles per hour. For hours at a clip we were the only souls on the road, surrounded on all sides by immense beauty, simplicity, and a rich culture that seeped endlessly into the landscape. The open road in front of us promised a seemingly never-ending passage to serenity. It became easy to reflect on our lives as we wound deeper and deeper into the mountains, further and further away from halogen lights shining down upon racks of processed foods, further and further away from the slightest chance of being disturbed in any way. I found myself smiling for extended periods of time as my inner monologue and I danced in concurrence as we harmoniously courted gratitude. Northern Thailand is a consummate showman with a never-ending stock of breathtaking views in its portfolio, and this part of the country is the feather in its cap. I made a sincere promise with myself that I would not forget that ride, how lucky I was to be there, and how unquestioningly easy it was to eschew negativity for days on end. I lovingly envisioned all of my closest friends and family and daydreamed they might catch a glimpse of my happiness; there was a sense of wanting to share the experience with everyone dear to me. The sense of freedom was so overwhelming it almost felt illegal—to move forward at great speed without knowing what lies ahead, unsure where our next meal would come from, or where we would lay our heads at night. This could potentially sound intimidating to some, however, for us it was the ultimate release. To stop when we wanted to stop, to stay where it felt comfortable, and to push on whenever we sought a new horizon was grand, and the luxury of having that choice was grander. The thing about riding the loop is it bestows a feeling of the infinite. The loop evokes a consciousness from deep inside, and what’s more, the loop lasts. I imagine it can be measured in comparison to the moment you reach the metal guardrail of the Grand Canyon, take in the view, and ponder how long you should remain there ingratiated with its beauty after the “wow” factor begins its rapid dissent, taking the marvel with it as it leaves. Day after day after day, we rode. Day after day, we slipped further into an impermeable mindset of freedom. The rest of the trip was phenomenal, however, it was riding the loop where we found ourselves, especially when we went off reservation for hours in each direction every time we saw a road that beckoned. We knew we would eventually head back to Highway 1285, but it was really rewarding to let go of concern for when exactly that would be. I have no intention of providing a factual account of the trip’s exact locations for you can refer to an online map if interested, but I will say my memories are of rolling mountains, hillsides rich in agriculture, forest and fields, flowers and flames—the smell of the brush fires we passed somehow transported me to my youth. I remember the smiles and the connections with the kindhearted locals from every small village we entered, tucked deep inside the countless curves in the road that snaked its way along the single mountain range separating us from Burma. I remember the authentic Northern Thai food that triggered explosions within my taste buds. I remember the admiration and curiosity of the Thai people the moment they realized I could speak their language and the feeling of satisfaction that it brought me. Mostly, I remember the curves of the open road and how perfectly spaced apart they were for a motorcycle to burn straight through the heart of a beautiful land filled with beautiful people. I remember, in a word—beauty. The rest of our trip was ripe with all of the fascination that comes with being a stranger in a strange land, but it also inevitably followed the more prescribed formula of a tourist. Some of the highlights were dancing through the water soaked streets of Chiang Mai during Songkran, the Thai New Year’s Celebration. Songkran is a magical time in Thailand where the entire country erupts in jubilant fervor as it celebrates the mark of a new year while symbolically washing away the bad with the help of water guns, hoses, and buckets of ice water. You can’t imagine how much fun it is to regress to the innocence of youth with a water gun in your hand and the fantasy of peril being eminent. Everybody remembers the game—if you’re shot you’re out! A dream come true for any kid at heart—everyone is a target. After a couple days we pushed onward in search of the ancient ruins of Angkor Wat. We took in a couple days in the Cambodian capital of Phnom Pehn before heading to Siem Reap, the staging ground to the temple structures. Angor Wat was a marvel of staggering architecture and timeless fascination, but that is another article for another day. Following our Cambodian adventure we cut back into Thailand and headed south to the Gulf for a few days of R&R on the beautiful tropical island paradise of Koh Chang. From there we made our way back to Bangkok and wrapped up the holiday with a trip to the sizable JJ Market for some souvenir shopping. All the while, we continuously recalled our time in the mountains as we watched the footage from our cameras and shared with each other the almost forgotten memories of that special time spent as free men, living the way we believe we were meant to live. We shared a deep appreciation and a mutual acknowledgment for how lucky we were. We basked in the afterglow of this experience, feeling elevated, and inspired. We bragged relentlessly to anyone in earshot. We put the videos together and watched our movie with a sense of accomplishment. Annile Alexander has lived in New York, San Francisco, and most recently in Southeast Asia where he was an English teacher. He is currently opening Thailand’s first Floatation Tank Center in Bangkok.